Soluble iron input to remote oceans from dust and combustion aerosols may significantly impact the ability of the ocean to remove carbon dioxide from the atmosphere. In this paper, the processing of insoluble iron during atmospheric transport is simulated using parameterizations that can be implemented in most Earth system models. Our mechanism reasonably matches observations and is computationally efficient, enabling the study of trends and climate impacts due to the Fe–C cycle. Atmospheric bacteria are thought to act as ice nuclei influencing the cloud formation. We used the aerosols captured in the snow cover on alpine mountain to investigate the sequential changes of ice-nucleation activities and bacterial communities at high elevation. The snow-cover samples exhibited high ice nucleation corresponding to the increase in natural and anthropogenic dust particles. Terrestrial bacteria (Bacilli) recorded in snow cover increased in relation to ice-nucleation activities. 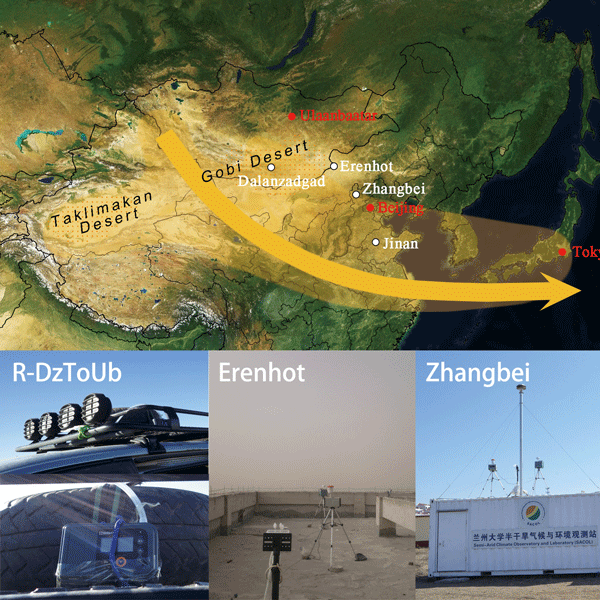 To our knowledge, this is the first simultaneous field measurement of bioaerosols in dust events at four sites along the transport pathway of Asian dust. The samples were analyzed by means of fluorescence microscopy, scanning electron microscopy, and MiSeq sequencing analysis. The results indicate that dust clouds can carry many bacteria of various types into downwind regions, the alpha and beta diversity of which were investigated. A synergy of ground-based atmospheric chemistry observation, lidar, and numerical modeling was used to investigate a super dust event passing over Shanghai. The degree of dust that was modified by anthropogenic sources highly depended on the transport pathways. A community regional air quality model with improved dust scheme reproduced reasonable dust chemistry results. The chemical and optical properties of evolving dust are crucial for evaluating the climatic effects of dust. This study directly characterized the morphology, composition, and mixing states of individual ice residue particles by using an individual particle freezing method. We show that clay mineral particles are more important ice nuclei sampled during an Asian dust event and that the internal mixing of particles during long-range transport has a complex effects on the particles' ice nucleating activity. This paper quantifies the radiative effects of dust and water vapour in the Saharan heat low. Dust has a warming effect at the top of the atmosphere while cooling the surface. Water vapour has a warming effect both at the top of atmosphere and the surface. We find dust and water vapour have similar effects in driving the variability in the top-of-atmosphere radiative budget, while dust has a stronger effect than water vapour in controlling day-to-day variability of the surface radiative budget. Sulfate and nitrate in dust particles at a desert site and a 700 km downwind urban site in China were compared. The production of the two salts during the transport of dust particles was limited because of the adiabatic process of the dust-loading air movement. Significant sulfate and nitrate previously reported in dust-associated samples were very likely from locally emitted and urban aerosols or soil-derived particles rather than the products of chemical reactions on desert dust particles. Atmospheric bacteria (bioaerosol) are transported from the Asian continental area to downwind areas in East Asia and influence climate changes, ecosystem dynamics, and human health. Aerosol samples transported for long distances were collected at high altitudes (500–3000 m) using a sophisticated helicopter-based sampling system. The high-throughput DNA sequencing remarkably revealed that the atmospheric bacterial structures at high altitudes change in response to the air mass sources. Anthropogenic dust emissions induced by livestock trampling were measured using a mini wind tunnel device in Mongolian temperate grassland. A scale factor in dust emissions revealed an enhanced effect of trampling on dust emissions. The enhancement rate in dust emissions was enlarged by increased friction velocity. Our results emphasize that better livestock management is crucial to prevent dust loads by reducing the effect of trampling on dust emissions in dust seasons driven by strong winds. We conducted a field campaign on exploring dust aerosol in Dunhuang farmland nearby Gobi deserts. The anthropogenic dust produced by agricultural cultivations exerted a significant superimposed effect on elevated dust loadings. Strong south wind in daytime scavenged the pollution and weak northeast wind at night favorably accumulated air pollutants near the surface. The local emissions remarkably modified the absorptive and optical characteristics of mineral dust in desert source region. Compared with the TD dust, the importance of the GD dust in eastern China, Japan, and Korea is always neglected. We focused primarily on the dynamic and thermodynamics mechanisms of dust emission and transport over TD and GD and further elucidate the influence of TD and GD dust on the entire East Asia based on a case study using WRF-Chem model in the study. Dating absorptive capacity of Asian dust is still an outstanding issue. In this study, we identify two types of Asian dust: Pure Dust (PDU) and Transported Anthropogenic Dust (TDU). Overall average SSA, ASY, Re, and Ri at 550 nm for PDU are 0.935, 0.742, 1.526, and 0.00226, respectively, with 0.921, 0.723, 1.521, and 0.00364 for TDU. Our results promise to update and improve accuracy of Asian dust characteristics in present-day remote sensing applications and regional climate models. 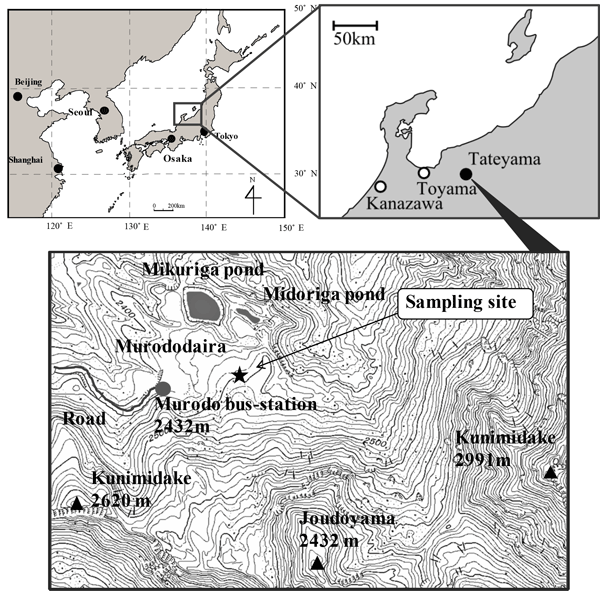 Polarization properties of aerosol particles at a suburban site in the western Japan was studied on the basis of long-term observation and trajectory analysis. This study provides the detailed information on the polarization characteristics of particles from different origins, and proposed a reliable criterion to classify spherical and non-spherical particles. This study introduced a new method to investigate the mixed state of dust particle with anthropogenic pollutant. An obvious peak in the total anthropogenic dust column, with much higher magnitude than those of wet regions, was observed in semi-arid regions. The anthropogenic dust column burden of semi-arid takes a positively correlated with the population and population change, indicating the production of anthropogenic dust in semi-arid regions is partly induced by human activities. We firstly evaluated the Spectral Radiation-Transport Model for Aerosol Species combined with a non-hydrostatic regional model through comparing the simulation results and satellite observations, both in horizontal and vertical. The dust and anthropogenic aerosols in summer over the Tibetan Plateau are evaluated, and their distributions over the TP are presented. The transport of these aerosols over the Tibetan Plateau is also explored via combining the simulation results and reanalysis data. 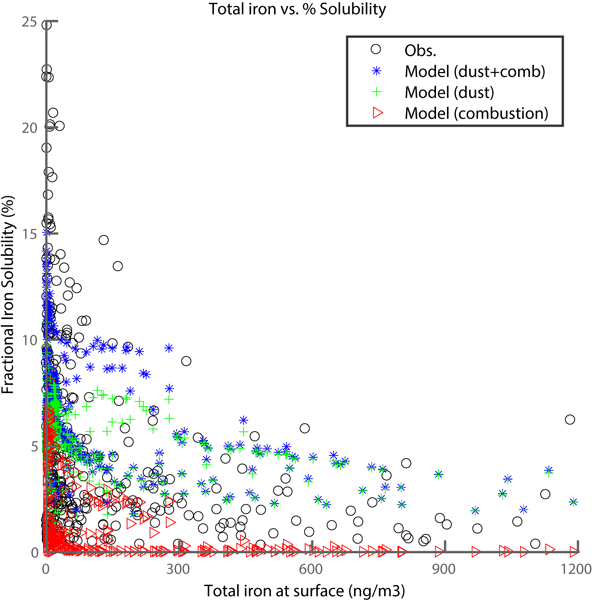 What is the real role of iron oxides in the optical properties of dust aerosols? Three different continuous datasets for complex refractive indices of hematite are employed in climate models, the real role of iron-oxides in the optical properties of dust aerosols becomes a key scientific question, and we address this problem by considering different refractive indices, size distributions, and more logical weight fractions and mixing states of hematite.More laboratory measurements should be taken into account when assessing the effect of mineral dust on climate forcing.